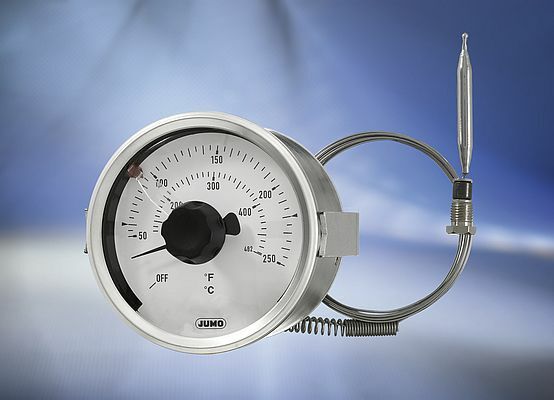 The dial thermometer with microswitch is a new addition to the JUMO product range. The device is a temperature controller with actual value display. It features an especially low mounting depth, a high-quality stainless steel case, and a variety of display ranges from -50 to +500 °C. The dicoTEMP 800 has protection type IP54, is RoHS-compliant, and cadmium-free. Dial thermometers with microswitches are universal devices for temperature measurement and monitoring. The microswitches, which are freely adjustable over the entire scale range, allow a control action to occur at the same time. As a standard feature up to 5 A, 230 V can be directly switched. Dial thermometers work without requiring additional auxiliary energy and are therefore especially energy efficient and reliable.